Looking for a shop that stocks baby teething products? 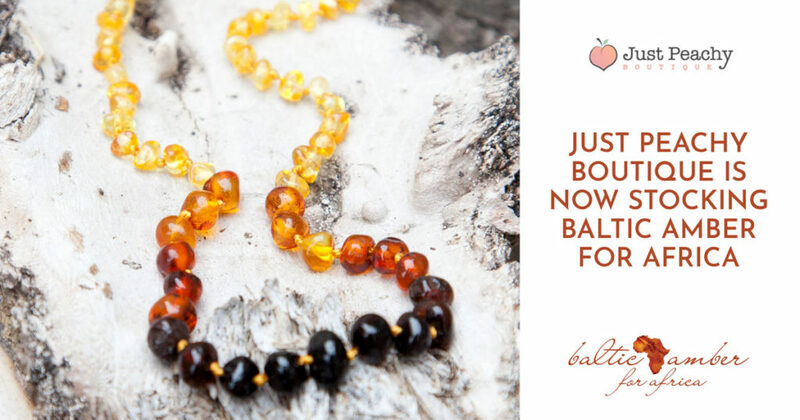 Look no further because Just Peachy Boutique, which sell baby products for both occasion and necessity, now stock Baltic Amber for Africa baby teething necklaces and bracelets. Our amber teething products are a great natural remedy to sooth pain in babies, which has been used since ancient times. The amber, upon contact with the skin, naturally releases Succinic acid which is completely harmless to baby and harbours many benefits along with it. The benefits of wearing the teething necklace or teething bracelet include: reducing inflammation, suppressing pain, and calming irritability. Our range of Baltic Amber necklaces and Baltic Amber bracelets come in a variety of different colours for you and baby, to choose from. Happy teething from Baltic Amber for Africa and Just Peachy Boutique! This entry was posted in stockists and tagged Baltic amber for babies, Just Peachy Boutique. Now in Durban, Daisy Chain Kids proudly stocks our Baltic Amber baby necklaces and bracelets. Repel ticks and fleas with this natural remedy which eliminates the need for chemical treatments on cats and dogs.